What does Jughead teach us about asexual activism? Excerpt from Jughead No. 4. Courtesy Archie Comics. Art by Erica Henderson. The most popular teen comic series for girls in America has an asexual character. So? Well, what matters is that Jughead isn’t a damaged savant genius (think Big Bang Theory) nor is he a repressed virgin (of whatever orientation other than asexual) waiting for (you can guess the rest of the narrative). He is a typical teenager; the thing most teenage narratives cannot cope with. It seems so normal, but the third window is actually deeply radical because it’s so normalising – a boy who identifies as asexual and a boy who identifies as gay chatting about their respective sexual/romantic relationships (I do think being asexual doesn’t preclude being romantic). If you actually had a trans* boy and a straight boy in the same window, it would be like the Four Horseboys of the Masculine Apocalypse. The rules of teenage school narrative would collapse (except for Teen Wolf, which I think would accommodate it). It’s important to recognise that this didn’t just happen by accident. Over 15 years asexual activists, such as AVEN, have campaigned for the increasing visibility, public awareness of, and, tolerance towards asexuals. With is striking is how successful they have been as a sexual and gendered social movement. 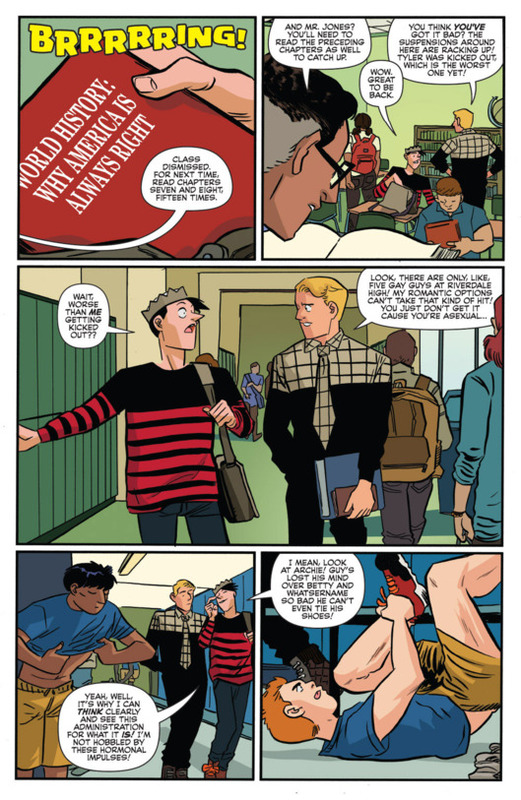 Chips Zdarsky talked about Jughead’s asexuality during an interview with ComicBook.com. He made it clear that he wasn’t making Jughead asexual for any personal identity politics issue. He was doing it because asexuality was on his radar and he felt it was very much on the radar of his target audience, particularly at the moment. Putting it on the radar is actually quite a big achievement, which has taken a fair number of people significant time and effort. Let’s not be fooled; there are intersectionally ways in which asexuality may be more easily ‘mainstreamed’ than other minority sexual and gendered identities. But Jughead teaches us that asexual activism is certainly getting some things right about the process of mobilising and organising around mainstream visibility and awareness. It might seem very little… Two boys walking down a school corridor, chatting as if it’s everyday… But it’s a lot.